Wondering how to stuff your moving boxes? Newspaper will do. No, really, it will. As will magazines, McDonalds bags, and junk mail. When balled up, they all help stuff your stuff in place in your moving boxes. 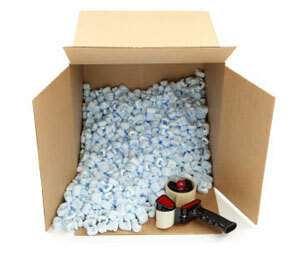 After the free stuff (newspapers and magazines), you have three basic options for moving box packaging: packing peanuts, bubble wrap and packing foam. Packing peanuts – They look more like popcorn, but they’re inedible nevertheless. However, these Styrofoam balls are great for filling the voids in moving boxes and protecting your stuff. Bubble wrap – PoP. pOP. pOp. You know the drill. This stuff is what a 7 year old would sleep on if she had the choice. And not only is it fun to step on; it’s air pockets protect your stuff well. Bubble wraps comes in different sizes of bubbles – the bigger the bubble, the bigger it can protect. Packing foam – This stuff comes in sheets, which you can trim down. It is great for pillowing large electronics and larger valuables. Just as important as packaging is the moving box you use. Find the right moving box for your things.